In Thailand’s northernmost province, set beside the Mae Kok River surrounded by mountains, Chiang Rai is home to numerous cultural and natural attractions. Today, experience some of the highlights of this charming provincial city. We visit striking temple Wat Phra Keo, where one of Thailand’s most important Buddha images was discovered in 1444. This sacred Buddha has been relocated by various state rulers and enshrined in their respective capitals as a symbol of dominance, including Lampang, Vientiane and Bangkok. 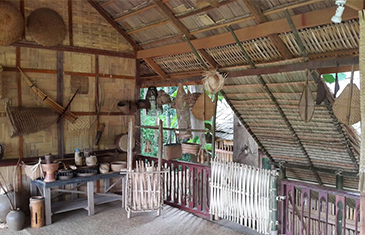 Continue to Rai Mae Fah Luang Museum, set in a cultural park, housing one of Thailand’s biggest collections of ancient Lanna Kingdom artifacts. Later, stop at Wat Ruang Khun, instantly recognisable for its striking white colour, why it’s also known as the ‘White Temple’ and relatively new compared to other Thai temples, built in 1997. 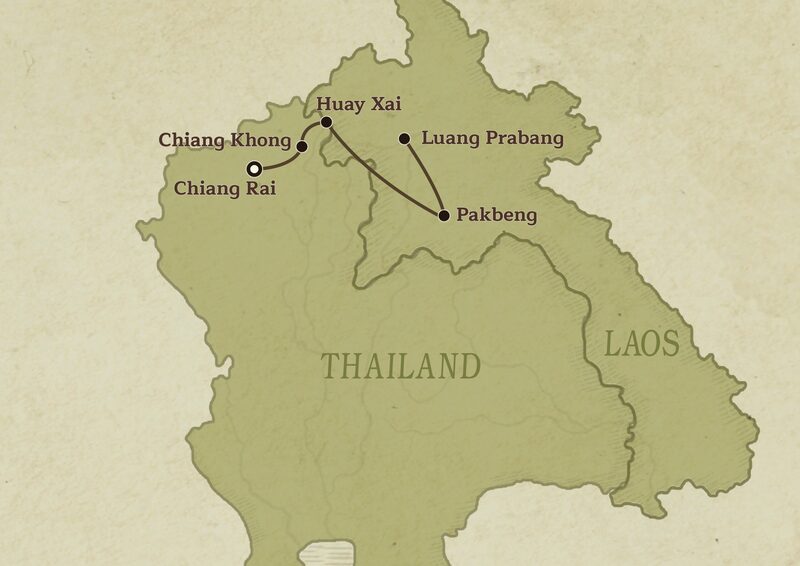 We make the overland border crossing at Chiang Khong over to Huay Xai in Laos. Deep within the Golden Triangle region, the capital of Bokeo Province, Huay Xai, has long been an important entry point from northern Thailand into northern Laos. From here, board the Luang Say cruise boat bound for Pakbeng. After an hour or so cruising along the Mekong River – Southeast Asia’s longest river – disembark at a traditional minority village. This stop gives us a unique opportunity to observe up-close authentic Mekong rural life. Our deluxe boat anchors at Luang Say Lodge, near Pakbeng, before dusk. There is ample time to enjoy the tranquil riverine scenery and catch the sunset from the teak and rosewood riverside bungalows. Spend another leisurely day exploring this naturally beautiful Mekong region, which remains largely untouched. During our cruise, we glide past granite cliffs, white sandy shores and fishing boats and make two stops. At the hill-tribe village of Baw, one of many typical minority villages secluded in hills, observe the age-old production of Lao whiskey. Later, we arrive at Kamu Lodge, a rustic eco-lodge committed to low-impact travel, set in a remote river valley of rice paddies backed by forested mountains. Amid this idyllic setting, participate in traditional activities such as rice planting and harvesting, fishing and gold panning, experiencing first-hand the Laotian rural life. Join-in more rural activities, followed by a traditional Laotian lunch, made with fresh produce plucked from in-house organic gardens. Depart Kamu Lodge to continue again cruising the broad Mekong River, admiring the wildly beautiful scenery. Heading downstream, we arrive at the Pak Ou Caves at the mouth of the Nam Ou River. Perched high on a limestone cliff on a river islet, these two limestone grottoes house around 4,000 multi-sized Buddhist statues and images. Worshippers, including Lao royalty, have visited this revered cave-temple for centuries. Later, sail into Luang Prabang, an ancient royal capital nestled at the confluence of the Mekong and Nam Khan rivers and encircled by misty mountains. UNESCO World Heritage Site Luang Prabang is considered the heart of Laotian culture and emanates an ethereal-like charm. At dawn, participate in centuries-old “Tak Bat” Buddhist ritual, offering alms to a steady procession of hundreds of monks. Continue to one of Luang Prabang’s numerous gilded temples (wats), stunning 18th century Wat Sene, known as “Temple of a 100,000 Treasures”. After making offerings here, participate in a Buddhist blessing ceremony. Explore this incredibly picturesque town further on a guided walking tour. We visit the Royal Palace converted to a National Museum and more enchanting temples, including Wat That Luang, the royal cremation site. Later, attend sunset cocktails and a private presentation at Ock Pop Tok, a Lao-based social enterprise dedicated to preserving Laotian textiles. 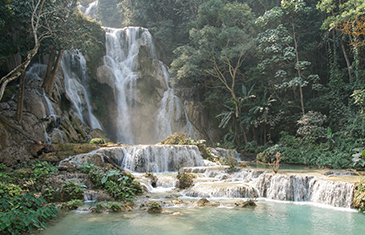 Explore the area around one of Luang Prabang’s most picturesque attractions, Kuang Si Waterfall. Hike through jungle parklands to Kuang Si Bear Rescue Centre, located nearby. Established in 2003, this bear sanctuary has rescued numerous bears from wildlife traffickers and traditional medicine traders. A guided tour imparts what can be done to protect one of Laos’ most endangered species. We also help-out with the bears’ midday scatter feed. Afterwards, stroll to Kuang Si Waterfall, where cascading tiers plummet down into azure pools. Outside Luang Prabang, immersed in rice paddies, get to understand the significance of bamboo in Lao culture. We learn about bamboo’s traditional and modern uses and join classes in both bamboo weaving and bamboo-inspired cuisine. Transfer to Luang Prabang International Airport for your onward flight.